It is hot here in South Florida. Way too hot for my liking. The type of hot where you wonder why you do your make up because it is sure to melt right off your face during the short walk from the garage door to your car. So when we were in the mood for a homemade dessert the other night, I knew I would not be turning my oven on. So I did what any person would do, I scrolled through my "Desserts On My List Of Things To Make" Pinterest board slowly ruling out all things that required preheating my oven to 350 degrees. That left me with very little by the way...I found a few ice cream treats but seeing as how the sun was still up and the humidity was 115% I decided that not only would I not be turning on my oven, I would also not be leaving my house to pick up any missing ingredients that I didn't have on hand. 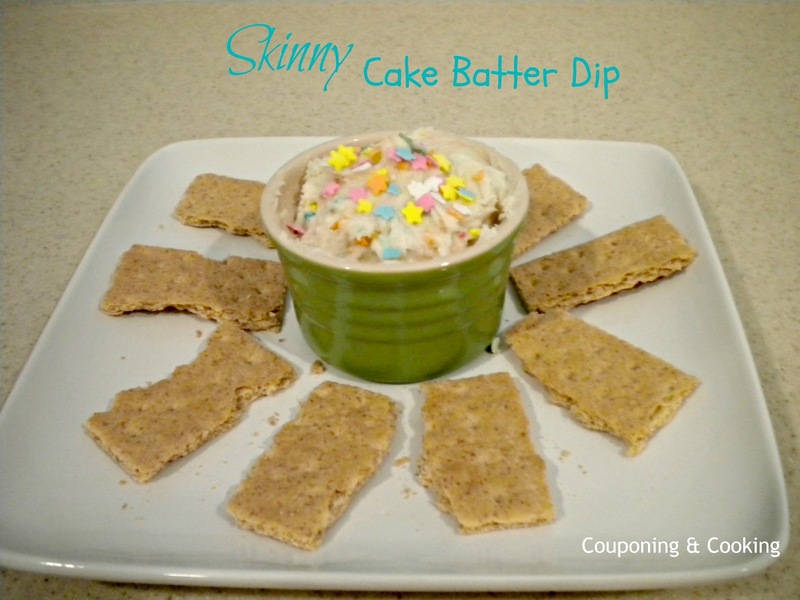 Then I realized that I had pinned quite a few recipes for Skinny Cake Batter Dip and that being the person that I am, I actually had everything on hand to make it. I mean who doesn't have a stock pile full of funfetti cake mix and fat free cool whip? But Skinny Cake Batter Dip seemed like a strange thing for Justin and I to sit around eating by ourselves. I didn't have any cute animal crackers or Teddy Grahams to dip in it and chances are if I just made the dip and handed Justin and I each a spoon we would probably have eaten the whole thing in one sitting. And while it might be "skinny" that is still unacceptable. Then I found a box of low fat graham crackers and an idea was born. It is so simple you will laugh. I just tweaked the standard Skinny Cake Batter Dip that is floating around on about a million blogs right now and I sandwiched it between two pieces of low fat graham crackers. I then rolled/dip the edges in sprinkles to add some fun and froze them in a Tupperware container. 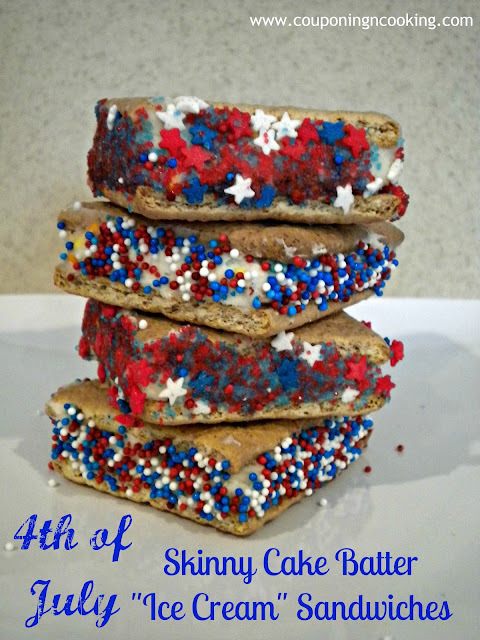 I made some 4th of July themed ones too! They are delicious, way better than I thought they would be. Like I would probably buy them if they sold them in stores. 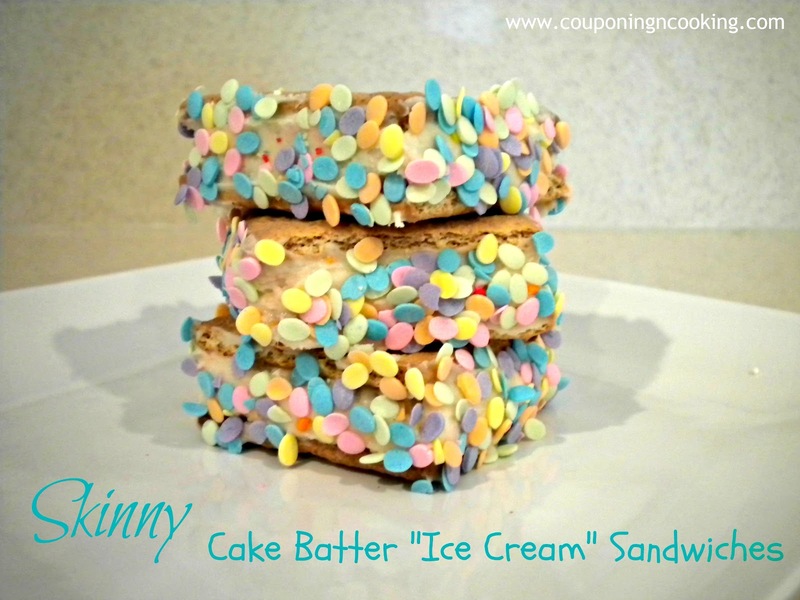 They are a great way to have a cold, refreshing treat without the heaviness and (way more) calories of a "real" ice cream sandwich. The Greek yogurt and all its protein makes them pretty filling for such a light dessert as well. And they are pretty cute too. Justin even called them precious. And my husband does not use the word precious. Ever. In fact, in over eight years of being together I don't think I have heard him use it. So they must be cute. 1.) Mix the three first ingredients together. You will have to mix them very well and it may take awhile but you want to make sure you fully incorporate them so you don't get random bites that are all cake mix or all Greek yogurt/Cool Whip. Finished product before adding sprinkles. What a great recipe! I love using cool whip, especially with cake batter! Yum, looks great to me!!! Wow...so easy and fun and YUMMY! Oh, those look good! And the sprinkles definitely make them "precious"! Love! I love when ideas are born just right in the kitchen with what you have! 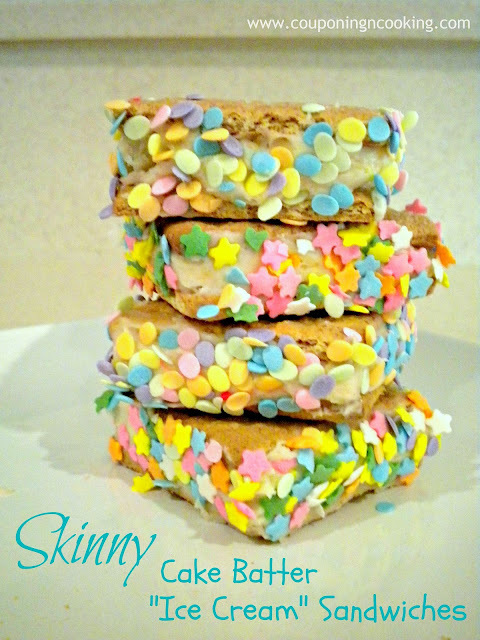 I love sandwiching homemade frosting in graham crackers, rolling in sprinkles, and freezing them too. YUM! OMG! That looks delish! Thanks for sharing at the Pomp Party! Pinning to our Pomp Party board! I love cake batter anything! Pinning! Thanks for linking up at Pin It Wednesday! 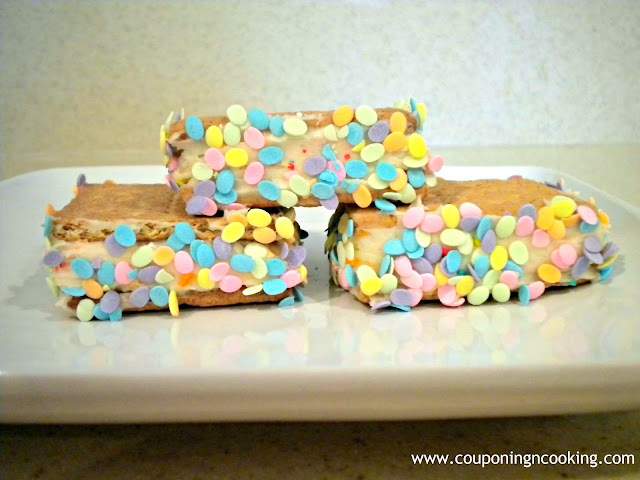 I just love Ice Cream Sandwiches and your recipe looks awesome, can't wait to give it a try. Hope you are having a great holiday week and thank you so much for sharing with Full Plate Thursday. I bet those are delicious. We've just been doing ool whip frozen bw graham crackers. What a quick and yummy dessert! Thanks for sharing at Terrific Tuesdays. Looks like an excellent recipe! Thanks for linking to Things I've Done Thursday! Oh, I love this! I'll have to make some for my daughter...and me! I'm dripping in sweat right now so I'm lovin' the looks of these guys! Thanks for linking up! So simple! And how pretty are they?! 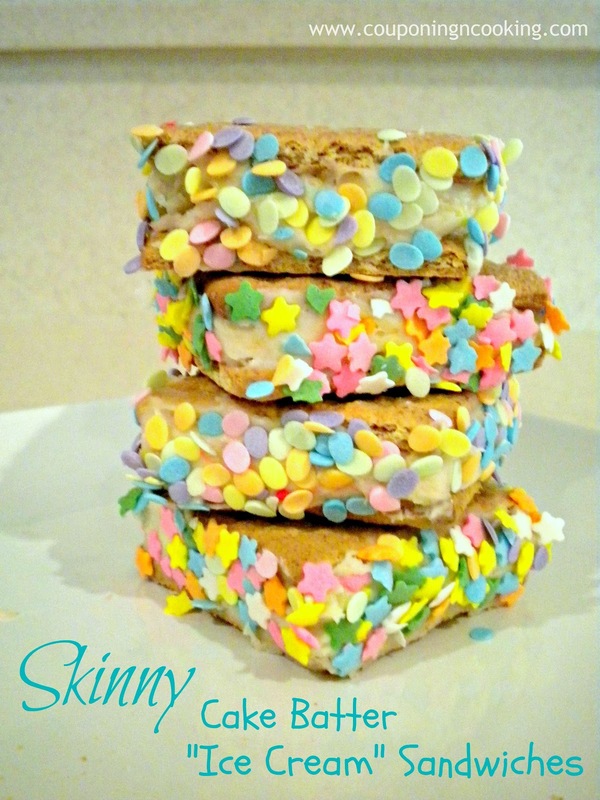 Any dessert that has skinny and cake batter in the name has to be yummy, right? So festive for a summer party. Thanks for sharing your recipe on foodie friday. Can I say YUMMMMM! Oh my word they look so good and the ingredients are nice and healthy :-) Thanks for linking up at Heavenly Treats Sunday! Looks so good! Love this idea and it's nice that they're pretty healthy too! These are soooo much FUN!! These look divine! Yum! Thanks so much for sharing on Tout It Tuesday! Hope to see you tomorrow. This looks AMAZING thank you so much for sharing!! I hope you have a very blessed day! This looks wonderfully delicious! I love the new trend of all the cake batter desserts. Thanks so much for linking up to Creative Thursday last week. I can't wait to see what you link up next. Have a great week. These look delicious! Thanks so much for linking up at Fabulous Friday. I featured you! All of them looks delish, and skinny, right up my alley. I'm liking the cake batter desserts. So party festive! Thanks for sharing your creative inspiration with Sunday's Best! Heat and humidity once again paired to force creation of a brilliant summertime treat! Love the sandwich idea! Thanks so much for sharing on Busy Monday at A Pinch of Joy. Hope to see you again soon! Happy Friday Kaylee! You're the top feature at Mom's Test Meal Mondays this week!! Thank you so much for sharing such a wonderful recipe!